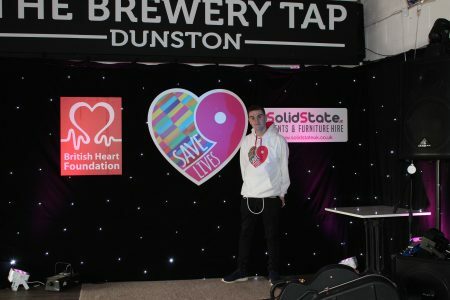 On Saturday we were proud to help Save 9 Lives put on their first fundraising event of 2018 in partnership with the British Heart Foundation. It was a fantastic experience for our team travelling up to Newcastle and meeting so many amazing people on the day. Over the last 3 years Jim Lynskey has been raising money for the British Heart Foundation through his award winning organ donation Save 9 Lives. We were originally contacted by Jim a few months back and we were so inspired by his story we were determined to do anything we could to assist him in putting on this great event. 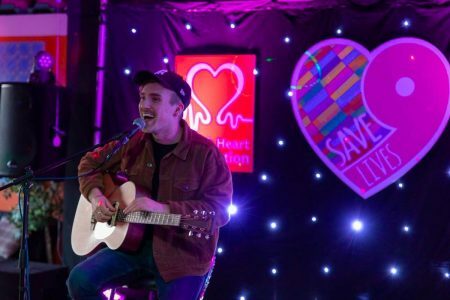 Jim is the youngest person in the UK with an LVAD, a mechanical heart pump that keeps him alive and has been on the organ donation list for the last 3 years. 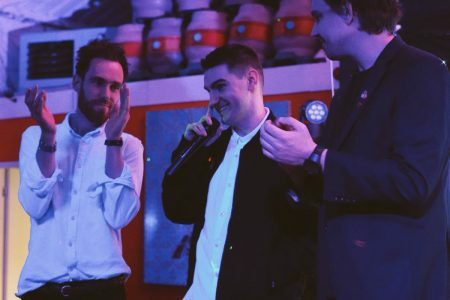 Jim has been a huge inspiration to many with his campaign dedicated to raising awareness with charities throughout the United Kingdom and also getting the opt-out organ donation system in place in England. 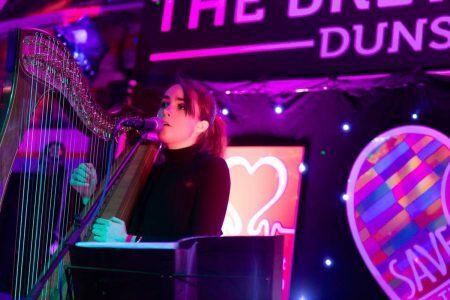 The fundraiser itself took place at the Great North Eastern Brewery in Gateshead, Newcastle. With performers such as Tom ‘Mouse’ Smith, Anna McLuckie, Cape Cub, Vito, Tom Daws along with some brilliant keynote speakers. Our team arrived early on Saturday afternoon to set up a nice sparkly black backdrop on the stage for the singers to perform in front of. 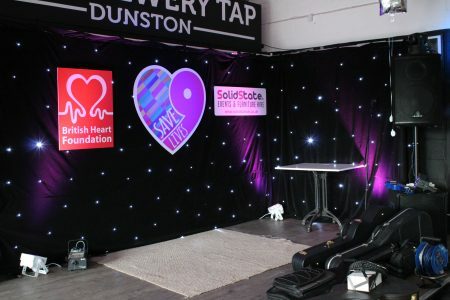 On the backdrop we were tasked with designing, printing and fixing logos for Save 9 Lives and the British Heart Foundation. 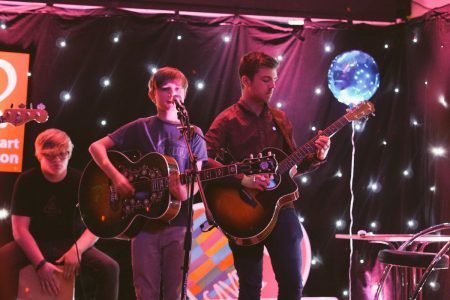 In summary it was a really fantastic event that we were privileged to be involved in, it was an absolute pleasure to meet Jim and many other great people on the day and we hope the fundraiser will make a big difference! Are you planning a charity event? If you’re planning your planning a charity event we would absolutely love to help. Our 2018 wish is to help one brand new charity everything month of the year. We are offering a donation of £300 in our services, so please feel free to visit our charity work page to fill out the form and we will get in touch as soon as possible if your submission has been successful. Over the years we have supported a whole range of charities, supporting events in Leicester and the UK including; Coventry, Derby, Northampton, Nottingham, Birmingham & London. To get in touch you can give us a call on 0116 2885956 or alternatively you can email us on info@solidstateuk.co.uk. Just a note to say thank you so much again for your mammoth efforts on Saturday to make my event look so special. It was a delight to meet yourself and your partner, and I really hope to keep in touch in the future. About to start an event like Save 9 Lives Fundraiser?